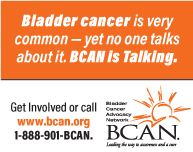 Bladder cancer is the most expensive malignancy to treat over the lifetime of patients [1, 2]. What is not often recognized, particularly by treating physicians, is that these costs are frequently a source of great concern and anxiety among patients with the disease and their families – a condition termed “financial toxicity“ (FT). This was emphasized in a recent article by a team at the University of North Carolina’s Lineberger Comprehensive Cancer Center . In it, researchers identified patients with a diagnosis of bladder cancer from Cancer Center rosters and asked them to reply via a computer assisted telephone survey to questions about demographics, healthcare access, comorbid conditions and treatments for those conditions and their bladder cancer. Additional questions came from validated questionnaires on FT and health related quality-of-life (HRQOL). Of the 144 patients enrolled, 96% completed the baseline survey, with 24% experiencing FT, which was defined by agreeing or strongly agreeing with the statement “you have to pay more for medical care than you can afford“. Characteristics associated with FT included younger age, being African-American, having non-muscle invasive (NMI) disease, having a lower Charleson comorbidity index, and receiving less formal education (as education increased the chances of FT decreased). Critically, patients with FT were more likely to delay care because of personal factors, such as inability to afford general expenses or to take time off from work. Needless to say, those experiencing FT had lower “general cancer specific QOL, and physical and functional well-being”. In a multi variable model, age (younger) was the strongest predictor of FT, rather than tumor stage, comorbidity, education, or type of insurance. The study clearly has several limitations, including being performed at a single institution, a referral center biased toward multidisciplinary and complex care. Indeed, half the cohort had muscle invading or more advanced bladder cancers, and those with NMI disease were usually patients who had BCG unresponsive cancers. This is hardly representative of all bladder cancer patients of whom the majority have low and intermediate risk NMI cancers. Additionally, the study had a small sample size and defined FT by the response to a single question, which clearly is open to interpretation and may be very time and circumstance dependent. Those limitations notwithstanding, validated instruments were used, participation was exceptionally high (96%), and except for age – median age 66 years old rather than 73–74 in the Surveillance, Epidemiology and End Results (SEER) registry,  the other demographics (primarily white, male, and the majority having limited education) were fairly representative of bladder cancer patients. More importantly, the authors identified FT as a major issue for bladder cancer patients, which not only reduces their QOL, but also may negatively impact their disease outcome. They discuss approaches which clinicians and patients can follow to lessen this burden. The first is for physicians and patients to discuss treatment costs, which should fit into the discussion about treatment options. While all physicians outline potential complications, side effects, expected courses of treatments, alternative approaches, and follow-up schedules, they often do not discuss costs and related factors (e.g. will transportation need to be arranged?). One of the huge barriers to doing this is not only that physicians are often unaware of many costs, but also that the proportion of those costs to be borne by patients, given insurance deductibles, co-payments and co-insurances, varies considerably from patient to patient. Indeed, in the North Carolina study, the inverse relationship of greater age and comorbidity status with FT was probably a reflection of almost all United States citizens age 65 and older having Medicare as a major insurance, and that they may have already spent down their insurance “deductibles” for their comorbid conditions (resulting in lower out of pocket expenses for bladder cancer). Furthermore, physicians are not educated in calculating costs, particularly for individual patients, and often feel uncomfortable in discussing this with patients or delegate specific details to others on their staff . Zafar and colleagues have suggested developing a framework to teach physicians how to calculate patient costs and effectively discuss them with patients. This has been done for other sensitive topics (like end-of-life care) . However, they also recognize that many patients feel uncomfortable in bringing up financial problems concerning their personal health, particularly for cancer care. Moreover, patients often don’t recognize their full responsibility in terms of medical costs . A second matter concerns the actual expenses of tests and treatments and how these greatly impact the costs for which their patients are responsible. Physicians may not know or think about the cost of an imaging study, laboratory test or medication, but we are the ones who order them. We not only can do a} much better job adhering to guidelines, but also we must utilize evidence-based methods more rigorously to formulate them (e.g. how often should bladder cancer patients undergo upper track imaging? using what modalities?). However, probably the lowest hanging fruit for containing the costs associated with bladder cancer and to reduce FT is developing better evidence-based methods for managing and treating low and intermediate risk NMI urothelial cancers and adhering to those guidelines. Indeed, intensity of treatment has been shown not to correlate with all-cause, and bladder cancer-specific mortality, when analyzed with the SEER-Medicare data set . Of course, there are many problems in using large administrative databases to assess the influence of intensity of bladder cancer management and treatment on how individual patients fare, and there are many desirable oncologic and clinical outcomes that were not evaluated in this study. However, our management strategies warrant re-evaluation, scrutiny and discussion with patients, not only in terms of disease control and side effects – but also the financial burdens they create. Botterman MF , Pashos CL , Redaelli A , et al., The health economics of bladder cancer: A comprehensive review of the published literature. Pharmacoeconomics. 2003;21:1315. Mossanen M , Gore JL The burden of bladder cancer care: Direct and indirect costs. Curr Opinion Urol. 2014;24:487. Casilla-Lennon MM , Choi SK , Deal AM , et al. Financial toxicity among patients with bladder cancer: Reasons for delay in care in effect and quality of life. J Urol. 2018;199:1166–73. Cancer Facts and Figures, 2018. American Cancer Society Journal, CA: A Cancer Journal for Clinicians. 2018. Ubel PA , Abernethy AP , Zafar SY Full Disclosure – Out-of-Pocket costs as side effects. N Engl J Med. 2013;369:1484–96. Zafar SY , Ubel PA , Tulsky JA , et al. Cost-related health literacy: A key component of high quality cancer care. Journal Urology Oncology Practice. 2015;11:171–4. Hollenbeck BK , Ye Z , Dunn R , et al. Provider treatment intensity and outcomes for patients with early-stage bladder cancer. JNCI. 2009;101:571–80.